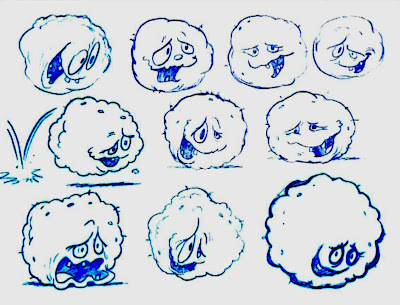 So, a long time ago when I still had time to post somewhat interesting things on this blooog, I did a theory post about developmental sketches. It's theoretical because I myself have never worked professionally in the industry, so my opinion isn't really valid. Think of this as just me thinking aloud. If you really want to read it for reference purposes, then click here. 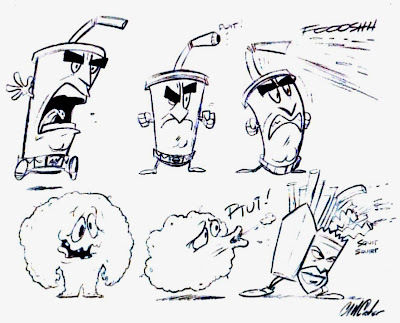 Anyway, the best drawings from that post were all done for Aqua Teen by Clay Croker, who in addition to doing animation and design work for a lot of early [adult swim] programs also voiced several of the characters. 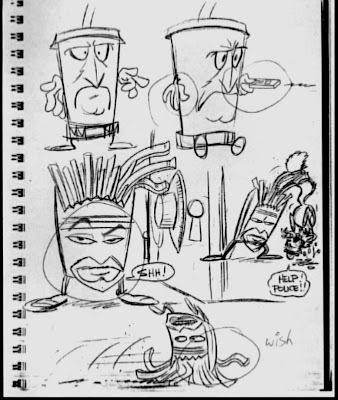 Zorak, Moltar, Steve, Dr. Weird and a bunch of one shot characters for The Brak Show and Perfect Hair Forever all owe Clay's tonsils a debt. The other part is that there's always the chance that if you can provide something that the client "can't live without" then you might be able to push the project down a cooler path than had been originally envisioned. 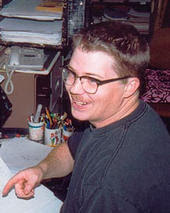 A lot of the drawings I did were done over a 3 or 4 hour period when I met show creators Dave and Matt over at the Highland Tap one rainy Sunday afternoon in April 1999. 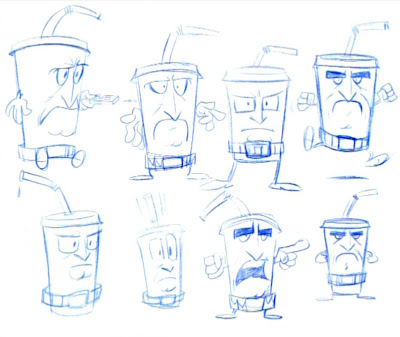 We drank pitcher after pitcher - they told me what they wanted and I drew about 10-12 pages of designs while we talked. 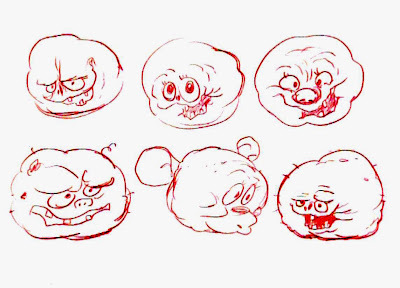 I guess this answers the question about what you need to make a good looking cartoon: a bit of beer and a bit of budget. 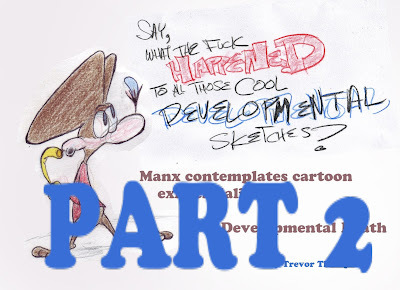 Say, just to clarify- I didn't do 2, 3, 4 or 6 of the art you have up on this post. Those were done by Matt Jenkins from Wild Hare Studios. 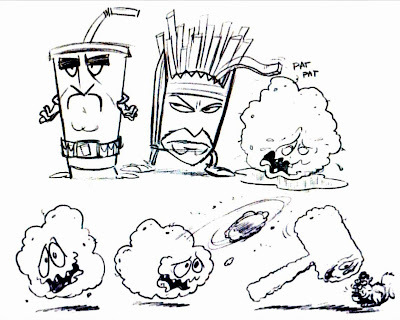 We both worked on designs, but in the end I did the final designs and the initial animation Meatwad, Frylock and the Danger cart for the pilot while Matt animated Shake, The Rabbot, Carl, Steve and Dr. Weird. Thanks for the clarification, man! 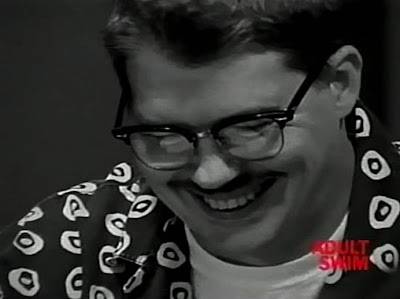 I took the ones Jenkins did out, although they were really swell. Did anyone other than the two of you contribute design work?